Like its predecessor, Samsung Galaxy S6 Active ships in a white/orange retail box with AT&T branding. Inside it, you will find the handset, a charger, a microUSB cable, and quick start guide. This year, Samsung and AT&T have opted not to include a stereo headset with the smartphone. Users will have to pick one up on their own dime. You will be hard-pressed to tell Samsung Galaxy S6 Active apart from its predecessor. Save for the different placement of the heart rate sensor, the newcomer is practically identical to the SM-G870A. Just like a year ago, Samsung Galaxy S6 Active look unmistakably like a member of the Korean giant's flagship family, but with added layers of armor. Some might argue that the device is not the best looking one around, but, after all, Samsung has not designed it to win beauty contests. That's what the regular Galaxy S6 and the Galaxy S6 edge are for. Samsung has once again opted to offer its rugged flagship smartphones in bold color schemes. This time around, they include Camo White and Camo Blue in addition to just plain gray. We reckon that the camo patterns suit the Galaxy S6 Active much better than any conventional color. Build quality of the Samsung Galaxy S6 Active is once again impressive. The device's polycarbonate body is just a tough as you'd expect, thus allowing you to be truly careless with its handling and not use a protective case. Furthermore, its water and dust resistance ensure that it will make it out of just about every life event unscathed. Physical measures of the smartphone are 146.8 x 73.4 x 8.6 mm, while its weight tips the scale at 150 grams. Samsung Galaxy S6 Active has almost the same footprint as the outgoing model and (unsurprisingly), it is considerably bulkier than the regular model (6.8 mm thick and with 138 grams of weight). The device is easy to handle, thanks to its grippy back and textured polycarbonate frame. Of course, the Galaxy S6 Active doesn't quite match the superb tactility of the regular model, but it more than makes up for it with its ruggedness. Like last year's Samsung Galaxy S5 Active, the successor has one major handling advantage over its regular sibling. Its hardware back and recent apps buttons cannot be pressed accidentally like the capacitive ones of the SM-G920. Above the display we find the earpiece, a couple of sensors and the 5MP F/1.9 selfie camera. A trio of keys for navigating your way through Samsung's TouchWiz UX. The volume rocker and the custom shortcut key are located on the left side of the device. The power/lock key and the nano-SIM card slot sit on the right. The top of the Galaxy S5 Active features the 3.5mm audio jack, a secondary microphone and the IR port that lets the smartphone remotely control various home appliances. On the bottom, you will find the microUSB port and the mouthpiece. This time around, the microUSB port doesn't need a flap cover like in past Galaxy Active iterations. The back of the handset is home to the 16MP camera lens with LED flash, the heart-rate monitor, as well as the single loudspeaker. A Samsung and an AT&T logo keep them company. 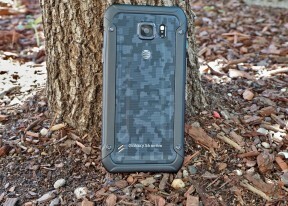 Samsung Galaxy S6 Active does not feature a removable back cover like past iterations. This feature is probably the reason why the device offers higher IP rating than its predecessors.